Green earth is used since Classical Antiquity. Green earth was often used in frescoes and a secco's like those in Pompeii and Herculaneum. Green soil was mainly won in the Czech Republic, Verona in Italy, in France and in Cyprus. 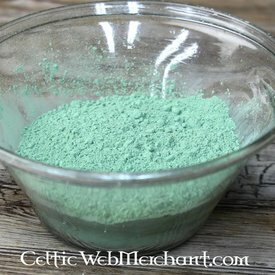 This pigment is not very opaque, but leaves a modest, natural color green. After the Middle Ages, in the early modern times, the color was often used as a pigment in oil paint for painting portraits.